Note: This article was originally written in 2003. Some minor edits have been made since. Our country monitors potential terrorist activity that could occur on American soil. Arizonans have been very aware, since the tragic events surrounding the attack on the World Trade Center and the Pentagon, that there are significant points in Arizona that could become terrorist targets. Most notable among these are the Hoover Dam, the Grand Canyon, and the Palo Verde Nuclear Generation Station. Arizona Public Service owns a major stake (29.1%) in the Palo Verde Nuclear Generation Station and operates the facility. Other owners include Salt River Project, El Paso Electric Co., Southern California Edison, Public Service Co. of New Mexico, Southern California Public Power Authority, and the Los Angeles Dept. of Water & Power. Construction began in 1976. There are three units, the last of which was completed in 1988. The total cost to build the plant was $5.9 billion. 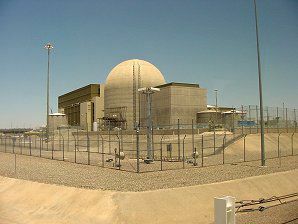 The Palo Verde plant is the largest nuclear energy generating facility in the United States. It is located about 50 miles west of Phoenix in Tonopah, Arizona. The facility is on about 4,000 acres. Approximately 2,500 people are employed there. In 2000 the Palo Verde nuclear plant generated 30.4 million megawatts of power. About 4 million people in California, Arizona, New Mexico and Texas receive power generated by the Palo Verde plant. Palo Verde is the only nuclear energy facility in the world that uses treated sewage effluence for cooling water. Palo Verde does not use fossil fuels to generate electricity. It is a zero-emissions facility. The reactors at Palo Verde are in an airtight, reinforced concrete structure designed to withstand the force of a jet airplane. The Arizona Division of Emergency Management (ADEM) is responsible for Arizona's Offsite Emergency Response Plan. In the event of an emergency, the Director of the Arizona Radiation Regulatory Agency (ARRA) will recommend to the Governor or the Director of ADEM, the protective actions to be taken. The Governor or the Director of ADEM will then decide the protective measures to be taken by the people within the emergency zone. The decision is given to The Maricopa County Department of Emergency Management (MCDEM), which will then take the necessary steps to assure the safety of the residents. They will put out an Emergency Alert System (EAS) message to tell the residents what they need to do based on the decision of the Governor. Enhanced security in Arizona may also mean longer lines at border crossings, and at airports. But other than that, unless an attack actually happens, the Governor is requesting that Arizonans go on with their usual activities. For more information about Arizona's preparedness in the event of a terrorist attack or other emergency, and the current Alert Level for Homeland Security, please visit the Arizona Division of Emergency Management Web site. To report any suspicious activity in Arizona, call the Department of Public Safety Domestic Preparedness Operations Center at (602) 223-2680.